Browns have done plenty of drafting in recent years. Now they’ve been drafted. The NFL has put Berea in the spotlight for the HBO series Hard Knocks. The reality show focuses on one team’s storylines during training camp. Coaches don’t generally welcome the potential distraction from preparing for the coming season. So when no franchise volunteers to appear, the league selects a team who hasn’t appeared in the past decade, didn’t make the playoffs either of the past two years, and doesn’t have a new head coach. So the Browns, coming off only the second 0-16 season in league history, and with two of the top four overall draft picks newly in the fold, were the choice over the Bears, Buccaneers, Colts, Eagles, Ravens, Saints, and Titans. 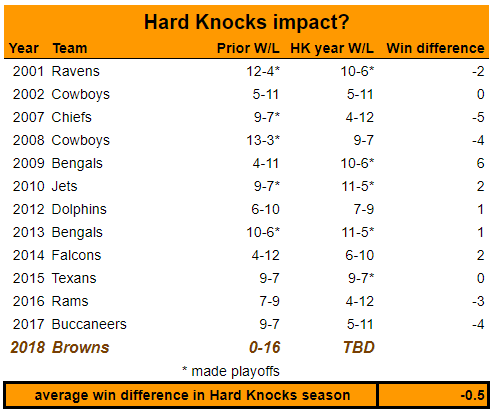 Is there a clear effect on wins and losses for teams that appear on Hard Knocks? This chart details the change in record of the featured teams from their previous season. With five improved seasons and five worse ones, it’s hard to make a case that being featured makes a difference in how well the season goes. One-half fewer wins falls within the range to be expected by chance. It’s negligible, especially if you include the 2004 Jaguars’ appearance on a similar NFL Network documentary series, as they improved by four wins that year. So fear not, Browns fans, and tune in without compunction. 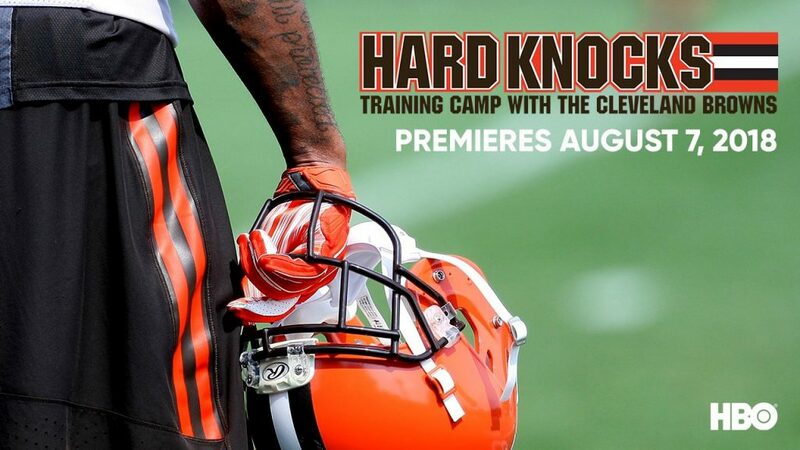 If any team belongs on a show called Hard Knocks, it’s the Browns. The main impact of their appearance is likely to be an upsurge in fandom — whether from renewal of frayed bonds or new exposure to this up-and-coming team of underdawgs. Anything that helps rewrite the script and change the narrative away from hopeless and hapless is all to the good. This entry was posted in fan focus and tagged media on May 21, 2018 by Dave Algase.